It has been a while since a Qing Dynasty drama was last played on Chinese television, but Hawick Lau (刘恺威) and Zheng Shuang’s (郑爽) new romance epic Chronicle of Life <寂寞空庭春欲晚> may rekindle C-drama fans’ love for Manchurian princes. Chronicle of Life, which also stars Michelle Yim (米雪) and Zhang Binbin (张彬彬), is adapted from the novel of the same name by Chinese romance author, Fei Wo Si Cun (匪我思存). It tells the story of a young nobleman’s daughter Ling’er (Zheng Shuang), whose family gets framed for treason and is punished to death. Ling’er manages to escape the execution with the help of close friend, Nalan Rongruo (Zhang Binbin). To keep her identity a secret, Rongruo sends her to the palace to service as a palace maid, and takes up the name Wei Linlang. There, she meets the young Kangxi Emperor (Hawick Lau), who falls deeply in love with her. Linlang struggles to deal with her growing feelings for Kangxi while still being in love with Rongruo. Things take a dramatic turn when Linlang’s older brother, who also escaped from the execution, returns to the Capital to exact vengeance on his family—and kill Kangxi. Chronicle of Life is Hawick Lau and Zheng Shuang’s second collaboration. Their first television drama together was The Cage of Love <抓住彩虹的男人>, produced and written by Tong Hua (桐华). The Republican-era drama featured Hawick and Zheng Shuang falling into a toxic relationship as they betray each other’s trust to find the truth of their families. Chronicle of Life premiered on Zhejiang Television, Shenzhen Television, and the streaming service Tencent Video on February 1, 2016. 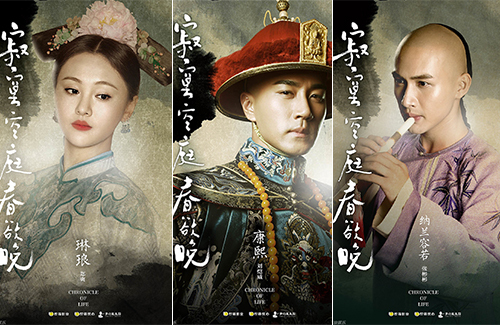 The story isn’t captivating, but palace dramas are fans favorite. It’s also good to change it up from wuxia/fantasy novels.